Here at Steve Jackson Games, we are both excited and sad to be coming to the end of our first series of monthly Munchkin comics. BOOM! Studios, our amazing publishers, has packed the final issue with extra pages, two stories by Munchkin Czar Andrew Hackard, and even two epic covers from favorite Munchkin artists: one by Ian McGinty and a variant by Derek Fridolfs. 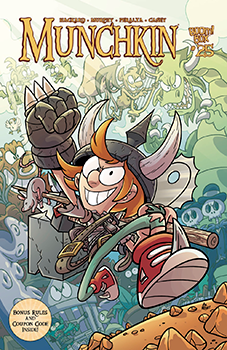 Munchkin #25 will be a worthy send-off to a great, funny series. 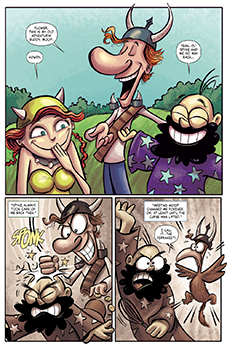 If you want to keep your comics in mint condition and still enjoy the exploitative exploits of Munchkin, watch out later this month for Munchkin Volume 4, and later this year for Munchkin Volume 5 and 6. We know you completists will want all the loot. When will Spyke, Flower, and the rest of the greedy, socially maladjusted gang be back? Well, they've got some serious looting to catch up on, but maybe, if we all keep them in our minds and hearts, they'll return, riding out of the sunset on giant chickens, wielding their ridiculously oversized weapons . . . and proceed to rob us all blind.